At the Lights Camera Africa Film Festival three teachers take their students to school—to borrow Fela Kuti’s idea of how a society gains consciousness. The topic is Modern Human Migration. The song Teacher Don’t Teach Me Nonsense befits what these three different filmmakers of different sociopolitical background have done with their films. Loyal students of their government as they are, their films on the topic tell stories of migration in starkly different ways. While the Nigerian filmmaker Alfie Nze, in his short film Granma, faults the woes of modern human migration on the migrants; Christopher Kirkley, in his magical realism film Zerzural, wants his audience to imagine Europe and America a mere illusion, a place people from other continents need not risk their lives for; whereas, on the far end of ideological polarization, Asmat, a short experimental film by Dagmawi Yimer, poetically illumines his audience on the horror of migration as caused by international politics and economic imbalance between regions of the world. Nze follows the story of a young aspiring musician whose cousin has just died trying to flee Nigeria to Europe through the Sahara desert. This sad news must now be taken to the cousin’s mother in the village. Jonathan is traveling with his own grandmother to relay the news of his cousin’s demise. On the journey, there is a clash between Joseph and his grandmother, people who are one whole generation apart. Jonathan is meant to confront the question of survival against all odds in a society that has little or nothing to offer him. The grandmother, having seen no difference in the body language of the one who just died and the one who is still living, asks the one who still lives with motherly concern: “What do you want to do with your life?” Eight out of ten young Nigerians don’t have answers to this question; it is the most confusing of all questions, most tiring. But at the moment, right on the floor of a room is the answer: a sum of money saved for Jonathan’s cousin to go to the university before he chose the path of the desert. Jonathan now has the money. Would he go to a university in Nigeria or follow the path of his cousin knowing all the risks involved Jonathan finds himself on his cousin’s path. There, the film ends, leaving the most crucial question untouched: why are young Africans so desperate to the point of putting their lives on the line for a life across the borders to Europe and America? It is clear where the director’s sentiments lie, just like what the government of his society teaches—or what the European government has taught his government to teach: A desperate attempt to flee the country for a better life is too risky to consider, better to make do with whatever resources are at hand in your country. It is a myopic, irrational and superficial interpretation of the modern human migration. Zerzura, however, seems to have answers to the question Granma fails to ask: although it looks like there is enormous intellectual, material and cultural wealth in the West, these are, in reality, not what they seem; they are false and deceptive. 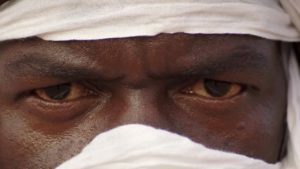 Through amazing pictures and sounds of a Nigerien society, Zerzura, by Christopher Kirkley, an American, follows the story of a young man migrating for the most unbelievable reason: braving the perils of the desert in search of a lost brother. Unlike Granma that never shows the actual travel of a migrant, Zerzura’s shots are almost entirely in the vastness and harshness of the Sahara, bringing to mind the descriptions of the desert in the book The English Patient by Michael Ondaatje. The young Nigerien—with his magical sword given him by a mysterious man he met at a well—overcome all odds to reach his brother, who has been condemned to slavery in a fictitious land of false wealth, lost dynasty and abandoned civilization. At the end he succeeds in bringing his brother home, and they live happily ever after in their ‘peaceful’ land of drought, thirst and hunger. Politically, this American filmmaker seems to be romancing Trump’s immigration policies but wrapping it in a cheap moral façade. Dagmawi Yimer from Ethiopia adopts a rather different approach in interpreting the problem of human migration. With a poetic rendition, he calls out the West and her policies of neocolonialism and propaganda “You European politicians, we come here, we are here…to observe your actions; the civilization you boast of.” With highly disturbing pictures of what it feels to drown, and pictures of enthralling performances from the bed of the sea, and recitations—or is it a dirge—Yimer recreates an assemblage of lost souls, all who drowned in the sea on their way to Europe and America. In tribute to them, he invokes their identities, beliefs, cultures and spirits. The film is a bold statement to the conscience of the perpetrators of civil wars for economic gains in the Middle East and policy-makers of poverty in Africa.